Indeed and Agreed, @tomiahonen nailed this post: Building the Ultimate Conference for Mobile – Starts with Speakers. He has pulled together the a-team list of folks to present, with tight schedule in fantastic venues, for the debut Mobile Rockstars World Tour! The world’s first true ‘all-stars’ event, the ‘best of the best’ speakers on the topic of Mobile. 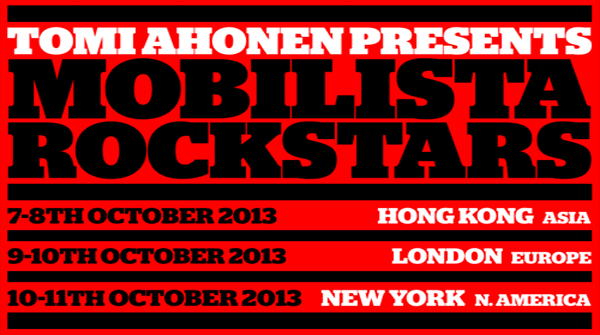 32 speakers, 3 cities on 3 continents in one week, October 7 to 11. We start in Hong Kong, fly to London and end in New York. If you are involved in mobile, if you are running a mobile department or a mobile project or are an investor in mobile, if you’re the strategy dude or business development gal, this is the shortcut to the future. I have said – for years – that Lars Cosh-Ishii is my personal guru to all things mobile about Japan. I’ve said – for years – that Tony Fish is my guru to all things about digital identity and privacy. That Gerd Leonhard is my guide to the media industry merging with mobile. If a client of mine asks who can help them with social media and mobile – I say JMac, Jonathan MacDonald is the guy who teaches us how to build ‘an Army of Fanatics’ etc. This is the ‘dream team’. This is the ‘Woodstock moment’ in mobile industry speaking, when the biggest rockstars came to the same stage. A great pleasure, and honor, to be invited = look forward to Really Rock.. Cya Out There!